Keen to enjoy your first canal boat holiday? You may have decided already that you want to enjoy the complete freedom for a weekend, a few days or a week but perhaps there are still some questions you need answered to help make it the best possible holiday for your family or friends. Don’t worry, help is at hand here as we answer some of the things commonly asked. So, if you’ve never sailed before; if you wonder how to navigate through locks or what you need to pack and organise before your trip then there’s plenty of information here to help and, of course, you can always contact our excellent customer service team for more help. Never sailed? Rest assured, Nicols boats are easy to handle, you don’t need a licence and you don’t need any experience! With some simple instruction on the day of departure you’ll soon learn how to control the canal boats and sail the waterways. Nicols boats are renowned for their simplicity and easy manoeuvrability. To learn more, see our section "Navigate without a license, it's easy". 30,000 passengers a year sail aboard our boats, and 80% of them are first time sailors: so even if you are new boating , there’s no reason to hesitate about indulging in the unique experience of a canal boat holiday! Cruise on canal or rivers ? Depending on your chosen departure base, you will be navigating along a canal or a river. You should keep in mind that rivers, which are wider than man-made canals, are sometimes subject to floods, especially in spring and occasionally autumn. These floods can lead to navigation restrictions meaning that, for your safety, we are forced to let you navigate on canal only or to change your base of departure, so as to avoid a risk of holiday cancellation. We will keep you informed of the state of these rivers before your departure. During your cruise, you will be free to stop wherever you want, apart from any private property of course! If you choose the calm of the countryside, please respect nature and leave no traces of your visit. If you prefer more lively towns or small villages that you cruise by, take advantage of the harbours and stopping places that have been built for staying boaters. 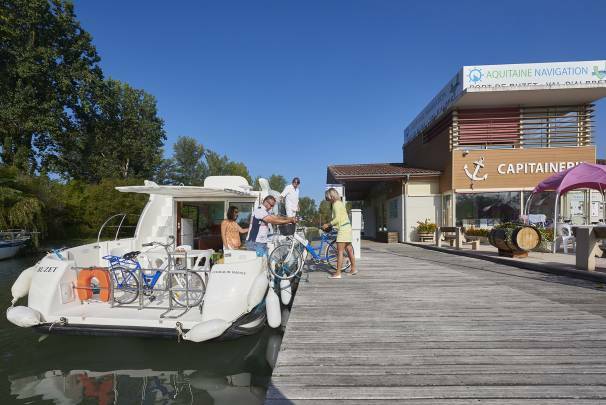 Although sometimes levying a small charge, these facilities offer comfortable and practical mooring places and often the best access point for a trip into the heart of a town or city. During your boating trip, you will certainly be passing locks. Their number varies depending on the destination you choose. If you choose canal boat hire in the Camargue region for example, the landscape is flat, so there are almost no locks! 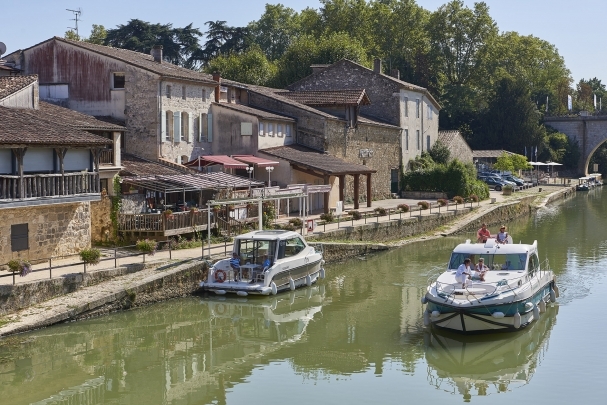 In contrast, if you opt for the Burgundy canal, where the landscape is hilly, you will find many locks. However, don’t let the thought of locks affect your choice of cruising destination! Passage through the locks is a simple and very pleasant manoeuvre. It also often gives the opportunity to meet other friendly boaters who will share with you their impressions of the route and give tips on the best tourist sites to visit. Are there days of closure? Some locks may be closed on public holidays. For more information, contact us. On your route, you will encounter a range of different size locks and weighbridges. Passage through them all is free. There are a variety of locks on the waterways, some of which are automatic and others which are manual. At those with a lock keeper, be aware that they can ask you for help. 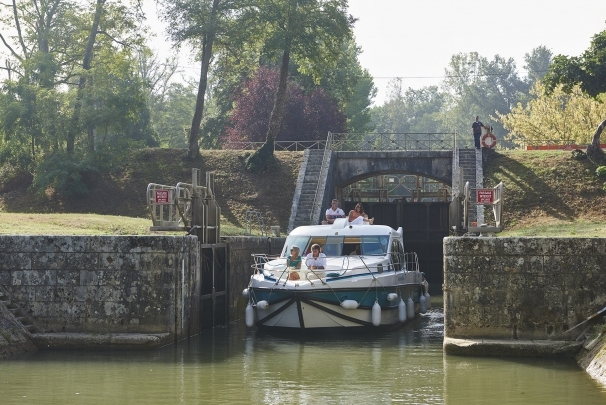 However in the Charente, all locks are operated by the boater which is helpful if you don’t want to be constrained by any operation schedules. One-way cruise or return cruise ? 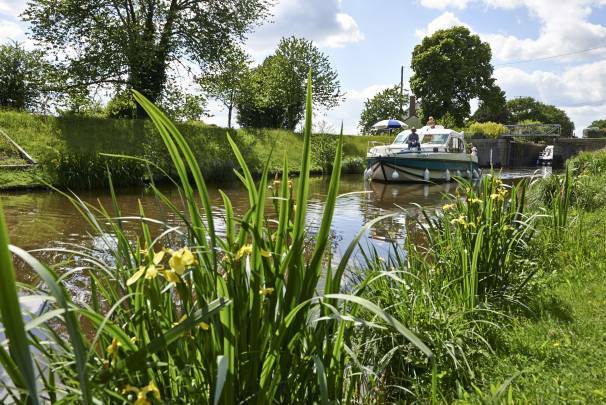 One great advantage of a canal boat holiday is the feeling of freedom it provides - organising your journey to run at your own pace, with complete independence. 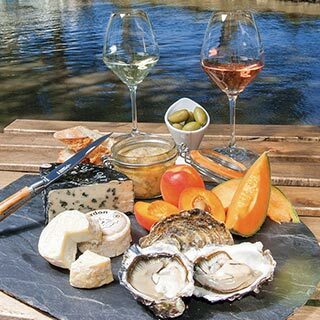 To make the most of this some forward planning is essential, particularly choosing between a one-way or return cruising route as will affect the time you take on your various stages. You will need to travel the distance between the start and end base within the time provided in your holiday – arriving late is not an option! The cost of a one-way cruise is higher with a supplement of €150 to cover the management and planning required. You may also need to book the transfer of your car from the start base to the end or transport to get your holiday group back to the start to collect your car. Due to the movement of boats, we can only confirm the exact start base within your chosen region 48 hours prior to embarkation. You must call our reservations centre then for details and information on the direction of your cruise. In the event of floods or navigation restrictions, it may be necessary to change the direction of your route to return to the start in order to avoid problems. In this situation we, of course, reimburse the additional costs of the one-way cruise. During your cruise, you stop wherever you want, whenever you want! If you find a corner of paradise and you want to moor there for several days, then no problem. All you have to do is make sure the boat is returned to the base by the agreed date and time. A return cruise has no additional charges like those of the one-way cruise. Don’t worry about seeing the same surroundings on the journey back on yourself. Life around the waterways is ever changing so we guarantee you’ll see new things of interest on the return leg of your holiday also! Wherever you cruise, you will appreciate having a bike to explore nature or to go shopping. The banks of canals and rivers in France are often designed to accommodate cyclists. The towpaths, formerly used to pull commercial barges, are still maintained today to enable bicycle rides. In Portugal, the surroundings of the GRANDE LAGO lake are ideal for mountain biking and our team at the Amieira Marina base will provide you with appropriate equipment if you wish. You can bring your own bicycles or reserve some for hire from ourselves before your departure. Don’t forget your safety equipment - in France it is compulsory for children under 12 to wear a helmet. Can I swim in the water ? When we think holidays, we think swimming. A boating holiday is no different so don’t forget your swimsuit! Depending on the cruising region you will sail on either canals or rivers. In both cases, swimming in the water can be possible. However, do not always trust the colour of the water! For example, "the green water of the Canal du Midi", sung by Mr. Nougaro, is the result of a water laden with alluvium (the Canal du Midi is fed by the channels that descend from the Montagnes Noires, among others), so where the colour of the water might initially put you off then it shouldn’t. It is not green due to pollution, on the contrary! What we do suggest however is avoiding the water in the immediate surroundings of big cities. Instead of these areas you will find on route other accessible places that are suitable for swimming, either in swimming pool and water park, or in natural water like in Charente. For those who don’t fancy swimming in the canals or rivers we recommend our heated and towed pool, a NICOLS exclusive! Animal friends are welcome on board. You will need to pay the pet supplement of €40 when boarding and don’t forget to bring everything you need, such as their blanket and bowls and take care to ensure they do not cause danger or nuisance to yourselves or other waterways users. Just because the weather is gloomy, there’s no need to let it spoil your enjoyment of cruising. You can still navigate in the rain and it won’t slow down your chosen itinerary. 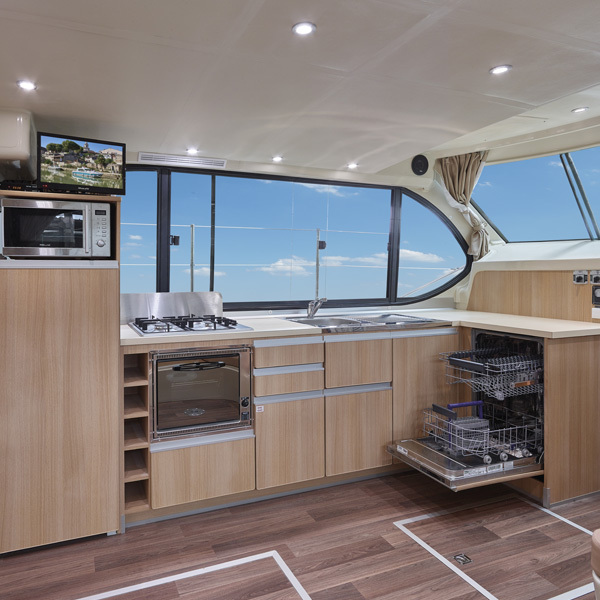 The boats (except the riviera range) are designed to offer 360 degree panoramic views so this maximises light and also means you can enjoy the scenery all around. Who says it can’t look beautiful in the rain? If you encounter a technical problem on board, Nicols breakdown service is on hand to help 7 days a week during office opening hours. Simply call your base immediately to report the nature of the problem together with your location and a technician will respond as soon as possible. In order to maintain the banks and locks of canals and rivers, periods of so-called "unemployment" can occur on the navigable network. 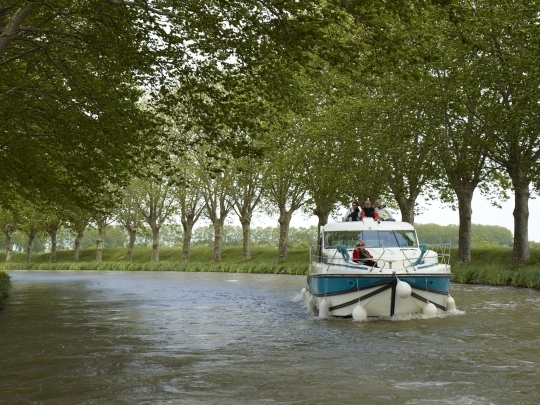 These periods of intervention are very rare during the season as the French Waterways attempt to perform them during the winter period. If, however, an interruption in navigation is announced which affects the plans of your cruise, we may have to change the departure point of our boats or change your itinerary without cancelling your cruise. If this should happen, we will do our best to inform you before you travel. How to book your cruise? Renting a canal boat with NICOLS is as simple as 1 - 2 - 3! Choose your canal boat according to the number of passengers. Choose the departure date and duration of your cruise. ... then simply contact our booking office or access our secure online booking service to find availability and book your boat. It's as easy as that! The cost of rental includes boat insurance and liability to third parties. For more details, you can consult our rental conditions. On the day of departure, you will pay a deposit to ensure your boat is returned clean and without damage. The deposit is refunded when you return your boat to the base. If you wish, you can purchase a cancellation insurance or buy a half-deposit. Please contact us for more information.